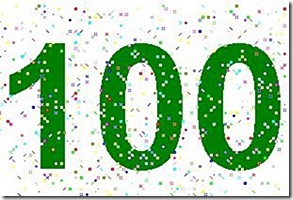 Please join me in celebrating 100 posts of this blog. Actually, Last post was my 100th post and I wanted to write about it then.But I felt this celebration deserved a special post by itself. One of the user pointed out to me that I am reaching my 100th post and even congratulated me in advance. Honestly I didn’t keep track until he told me 🙂 . Through these 100 posts, this blog helped me find tons of friends, inspire 1000s of people to start gardening and formed a very nice network of like-minded people. This site started out with a single aim of helping people who want to garden and will continue to be source of information for all gardeners out there, of course, with all your support and contribution. This site has grown to such an extent that today it receives several 1000 hits, 100s of emails per day compared to just a handful per month when I started it in Jan 2008. Back when I started this blog, I wasn’t sure if I will keep it updated regularly. I even thought it will be like one of those blogs that goes untouched after the first hello world post. I really thought. I was also thinking “who will read my blog”. Though I have been gardening since my early schooldays, blogging was quite new. But then thanks to the addictive hobby of gardening, I kept posting without even worrying if anyone is reading it. One day, I had visitors in my blog and I was so excited and few days later, more visitors. More appreciation started pouring and oh yeah! the questions too. From then on, there was no looking back. Today I want to take this opportunity to thank everyone one of you for all the contribution, feedback, comments and your curious questions. These are the things that really drive this website. More problems and questions led to more solutions and answers. I get lots of emails from people who got inspired to start a garden because of this site. Reading such emails is such a pleasure and I am motivated to write more and more on topics that will motivate people to grow their own food. With so much support from you all, who wouldn’t be motivated? In this post, I also want to make an announcement. I am starting a Training program on Terrace gardening. It will be a one day program and is aimed at making terrace/kitchen gardening a lot easier for those who are starting out. More details follow soon. EDIT: The training location will be at Bangalore at present. Interested folks can register for the same by sending an email to Trainings with subject Training. Like I mentioned in my previous post,the series of posts on Hydroponics is in progress and will be out soon. Indeed, your blog has been a great inspiration to me and many others. There’s so much gardening information on the Net, but hardly any for the Indian Gardener. Your blog has filled that gap. Thank you Geek Gardener. And Congratulations on your 100 posts. Keep blogging and inspiring. Happy Gardening! GG Simply great!! Lot of useful information for garden enthusiasts. Keep it up. you really inspired many like me. Congrats GG.. Great gardening site with tons of information and the forums are extremely useful for sharing information and stuff. Congratzz!! The training programme is like the icing on the cake.. I am looking forward to it. You as a person and your blog – both are true inspirations. Congratulations! And I assume the workshop will be in Bangalore only? congratulations to you and to all members. Proud to be a part of that blog. I have a request. I surf internet through my cellphone. So i can not be active in forums because text box of reply option can not be detected by cellphone. But i visit forums daily to get new informations, but can not reply. I am posting this comment through cellphone. This text box is ok, i can post here by my cellphone. Can you please make the forum’s text box same as this blog’s text box. It will make me more active. I requested you some time before , this is just to remind you. If possible please look after request. Thanks for the wishes. I do remember your request and As a cellphone surfer myself, I know how difficult it is to browse some forums that aren’t mobile friendly yet. I am trying to find software that can make this happen. Congratulations and thank you for all your posts. Your blog inspired me to start kitchen gardening too. Congratulations! Your blog has been a great inspiration to me and I have started growing vegetables too. Have not had much success mainly due to me not being able to devote enough time and attention (I am going to change this soon). I visit your blog almost daily to read the posts on the forum and always look forward to your posts. Keep up the great work and thanks for being the best source of gardening information for new gardeners like me. Hi congtats to you and all who make it happen, this 100 post celebration. I am very keen to attend your terrace gardening training program whenever you conduct them in Mumbai. Wish you all the best and keep it up!!! Hi congtatulations to you and all who make it happen, this 100 post celebration. I am very keen to attend your terrace gardening training program whenever you conduct them in Mumbai. Wish you all the best and keep it up! My heartiest CONGRATULATIONS for achieving your hundred! The icing on the cake is that you beat Sachin Tendulkar to it!! What is even better is the number of your admirers! Are you really able to sleep at all knowing that so many people look up to you for inspiration and guidance? Some people just seem to have real big shoulders like you, big enough to carry the weight of the aspirations of all of us. Have a ‘Good Night’!! Regards from a sincere admirer and well wisher. Congrats GG, and look forward to many more informative posts. I have mailed you a note for the training. Congratulations on your 100th post. keep up the good work. You are truly a great inspiration for people like me who are new to the gardening. I am looking forward to the workshops. You can seal polythene bag. Leaving a hole to breathe might let the plants dry as well. WHen I say “seal”, you dont have to ensure an airtight seal. Just no visible gaps thats all.